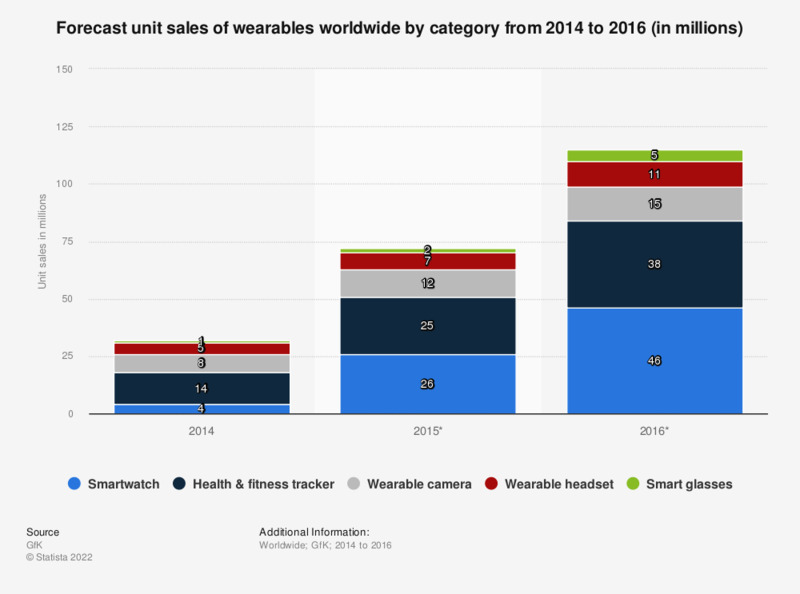 The statistic shows projected figures for the wearables market worldwide from 2014 to 2016, by product category. For 2015, the worldwide unit sales of health and fitness tracker wearables are forecast to reach 25 million units. After decades of being part of the essential arsenal of fictional heroes from Batman to James Bond, wearables (also known as wearable technology or wearable computers) are finally entering the mainstream. The precursors of the present-day devices can be traced back to the 1960s and have been continuously developed from the bulky strapped-on computers to the almost invisible, lightweight gadgets of today. Before entering the private consumer market with items such as smart glasses, smart watches, hearables, fitness trackers and smart health devices or even smart jewelry, many wearables were already being used by businesses, military forces and medical professionals. The launching of the Google Glass prototype in 2013, a type of smart glasses, marked an important moment in the public perception of the ubiquitous computer. The same year the worldwide wearables market was already growing constantly and was expected to more than double by 2018. The quick development of the smart watches market, including the new introduction of the Apple Watch at the beginning of 2015, is predicted to change the wearables landscape in the near future. As of 2015, the most important players in the smart watch market include Samsung, Apple, Pebble and Fitbit, as well as other electronic giants, such as Sony, Lenovo and LG. The most successful fitness trackers so far were produced by Nike, Fitbit and Jawbone, but all major sportswear companies are expected to follow suit.